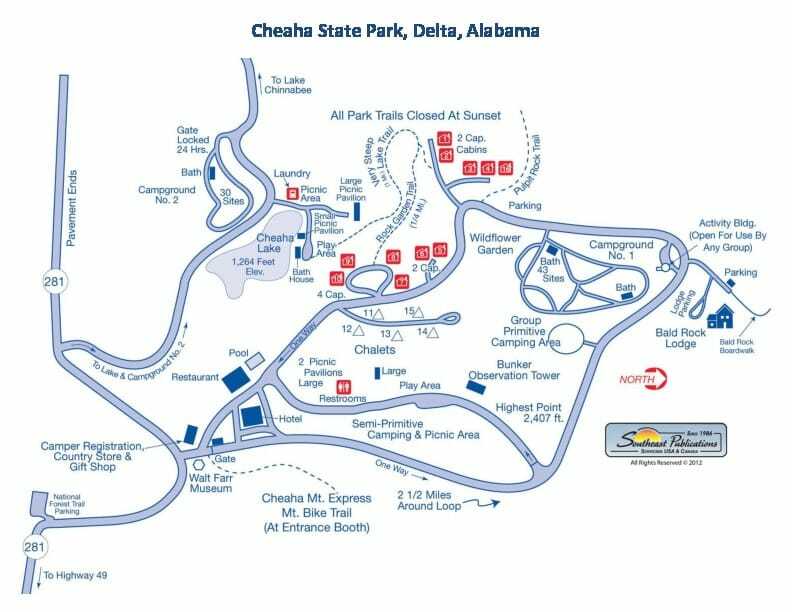 Cheaha State Park maintains location information on their web page which provides their address and a Google Map reference. Remember that Friday dinner is on your own. The restaurant in the park will be open. FOOTMAD is serving breakfast on Saturday and Sunday morning and after-dance snacks on Friday and Saturday nights. Please bring a dish for the Saturday potluck and food for any other meals you plan to eat that weekend. You may put your fully-cooked potluck dish in the kitchen coolers on Friday labeled with instructions for reheating. You are welcome to use the kitchen in the lodge to fix your Friday dinner and Saturday lunch and to eat those meals in the lodge. Bring all the snacks and lunch food you think you will need. There are no stores within 45 minutes of the park. Potluck dishes that need to be heated should be placed in the kitchen by 5 p.m. on Saturday. If you need to use the kitchen to prepare your Saturday pot luck dish, please have your dish prepared prior to 4:30 on Saturday. Please bring a labeled serving utensil for your potluck dish. If you leave personal food items in the Lodge refrigerator, be sure to remove them by 9:30 a.m. on Sunday. ​If you don’t want to eat off of paper plates, you are welcome to bring your own dishes. And be sure to note the recycling bins in the kitchen and use them when appropriate. Footmad will furnish coffee, tea, and water with meals and snacks. Please bring any other beverages you’d like. You may consume wine, beer and other alcoholic beverages in the lodge. Bring a water container to use during dances. You do not have to pay a camp fee upon entering the park. If you are staying in the hotel, cabins, or campground, you will first check in at the Camper Registration/Country Store office, which is the building on the left before the park gate. Staff persons and floor-space people staying in Bald Rock Lodge do not need to stop at the registration office. Your rooming information will be in the lodge. You can check into your rooms, cabins, and chalets starting at 4:00 p.m. CST on Friday. Staff members and scholarship folks staying in Bald Rock Lodge can also check in at 4:00. ​If a winter storm should cause the park to close, we will e-mail you and also will post an announcement on the Georgy-Alabam section of this website. In case of cancellation your registration fee will be returned and we will try to find another date for the event. The park will return any payment you have made for your rooms in the event of closure. If you encounter any problems with your room, report them to the Cheaha State Park office at 256-488-5115. Please be aware that Alabama’s state parks are horribly underfunded and the staff is doing the best it can with its resources, so be kind while expecting good service and lodging. Those staying in the lodge must be out of their rooms by 1:00 p.m. (CST) on Sunday. Check-out time for cabins and motel rooms is 11:00 a.m. Your key cards will stop working at that time. A reminder: Remove any personal food items from the Bald Rock Lodge kitchen before 9:30 a.m. on Sunday (if you wish to keep them). Free wireless Internet access is available in the lodge lobby, hotel rooms, cabins, chalets, group lodge, improved campgrounds, restaurant, and the country store. Cheaha State Park is in the Central Time Zone.